Travel Free on a $1 Million, Year-Long Vacation? I'm In. Two online travel resource sites are teaming up to offer you the chance to take a $1 million, year-long vacation for nothing, staying at the most luxurious hotels, eating at the finest restaurants, partying at the hottest nightclubs, and generally being decadent and extravagant for 12 months. According to the virtual want-ad, the successful applicant needs to be a very special individual who can research, be passionate about, and discerning in, travel. Oh, and you have to be able to write. Um …. Hello? Yoo-hoo!!! Over here!! I’m a special individual. Just ask my family. And dog. I can research. I’ve been a journalist for 28 years. I’m passionate. I haven’t had anything other than Fruity Pebbles for breakfast in 43 years. I’m discerning. I could pick out a Louis Vuitton pocketbook from 1,000 yards. I thank my wife for that. And I can write about travel. Wait. I already do this for a living, and for only slightly less than $1 million a year. OK, I’m out. It’s your game now. Luxury Travel Intelligence, along with VeryFirstToKnow.com, are the two companies behind the sweepstakes. They’re looking for someone (or a couple) to travel and review up to 50 different destinations, including hotels, clubs and restaurants, and to do it incognito. LTI will cover all travel-related costs including accommodations, food and entertainment up to $1 million over a one-year period. Applicants must be in a financial position to take the trip without remuneration and be free of any professional/business commitments. Now, there are caveats, of course. Clearly this gimmick is sponsor-driven. LTI and VeryFirstToKnow have noted that, "Certain agreed destinations and venues must be visited and comprehensive reports and insights must be delivered.” Read: People are paying us to be a part of this and we must go there and write about them. But if it were me, I’d rather make some venue changes. For instance, here are a few of the destinations that are locked in. THEIR CHOICE: Buenos Aires – reviewing the Four Seasons following its major refurbishment. MY CHOICE: Rio – reviewing whether the city is ready for the World Cup and the 2016 Olympics. MY CHOICE: Atlantic City – this once-great mecca is in a bit of a skid. Are things like the Tropicana’s $10,000/night suite bringing in the whales and the discerning traveler? THEIR CHOICE: Venice – checking if the Aman is living up to its potential, plus a look at the new Gritti Palace. MY CHOICE: Sicily – checking out the Monaci delle Terre Nerre. Talk about exclusive. 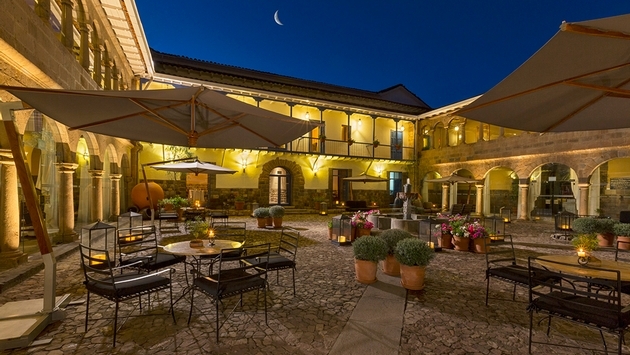 This restored 17th-century villa has only eight guest rooms. Of course, everything is debatable but, heck, would you turn down ANY of those venues? Probably not. So sharpen your writing skills.